This dissertation attempts to examine what socio-psychological factors influence foreign students’ second language (L2) learning in the context of the British higher education system. Primary quantitative data was collected from 114 foreign students by means of self-administered questionnaires. The graphical and statistical analysis findings demonstrated that foreign students’ motivation and personal goals were the only internal factors that affected their L2 learning. The excessive focus on foreign students’ perceptions and attitudes can be viewed as the main limitation of this study. The researchers who examine second language learning in the context of the British education system may be interested in this dissertation. Students learning in a foreign setting can face certain difficulties and challenges associated with acquiring the host country’s language (Zhou, 2016). The success of this process is considered to depend on various factors that exist inside and outside the classroom (Graham and Post, 2018). Although there is a large body of scholarly and empirical literature on the principal components influencing second language (L2) acquisition (Ruiz-Funes, 2015; Ma et al., 2015), too little attention has been given to foreign students’ L2 learning in the context of the British higher education system. This dissertation attempts to bridge this research gap by examining specific socio-psychological factors that influence foreign students’ second language acquisition in the UK. From the perspective of behaviourism and the sociocultural theory of education, the effectiveness of teaching English to speakers of other languages (TESOL) is mediated by both the social environment, in which students exist, and their inner characteristics (Mahmoudi and Mahmoudi, 2015). 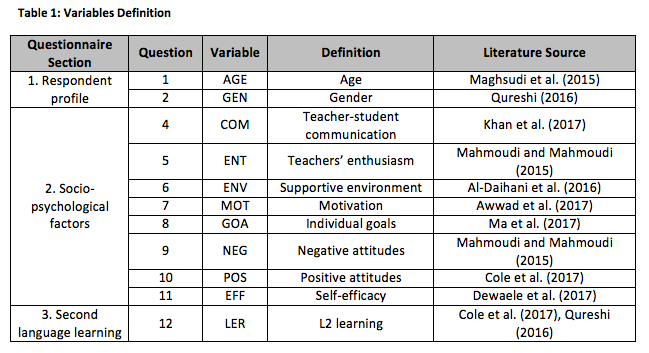 The factors that exist in the external environment can include the quality of teacher-student communication and English teachers’ enthusiasm (Cole et al., 2017; Al-Madani, 2015), In turn, individual goals and reasons, attitudes, age, gender, beliefs about self and motivation are usually attributed to internal factors that affect foreign students’ L2 learning (Qureshi, 2016; Arnon et al., 2017). The main aim of this study is to examine what socio-psychological factors influence foreign students’ second language learning in the UK. This aim is achieved through the attainment of the following research objectives. To review the most relevant second language theories relying on the existing literature. To identify the external and internal factors that influence foreign students’ second language acquisition. To identify the most important socio-psychological factors that have an impact on foreign students’ L2 learning in the UK. To provide British teachers with relevant recommendations as how to contribute to the effectiveness of their foreign students’ L2 learning process. This thesis is organised into five standard chapters, namely introduction, literature review, methodology, analysis and findings and conclusion. Chapter 1 describes the research problem and outlines the main aim and objectives. Chapter 2 reviews the most relevant literature in the field of second language learning in a critical manner and identifies a set of research gaps. Chapter 3 provides the reader with sufficient detail about the methodology and methods employed to achieve the main goal. The key empirical findings are presented and analysed in Chapter 4. Finally, Chapter 5 interprets the produced findings in light of the research aim and objectives and provides a set of practical recommendations as how to add to the effectiveness of foreign students’ second language learning process in the context of the British higher education system. In accordance with the sociocultural theory, the process of language learning is socially mediated (Gardner, 2010). This theory implies that individuals’ second language learning arises from a meaning-making process in collaborative activity with the host country’s population members (Pawlak, 2011). This statement is in keeping with Al-Madani (2015) who also reported that the second language learning process took place in a certain social context. As a result, learners develop their L2 skills and knowledge through the interaction and collaboration with other social actors (Cole et al., 2017). At the same time, as noted by Egalite et al. (2015), cultural differences between foreign students and local citizens could result in the emergence of certain communication barriers, which could produce a negative impact on the quality of the learning process. Behaviourism is another second language acquisition theory, which can help the researcher examine socio-psychological factors that affect foreign students’ ability to acquire the English language (Jones and Mixon, 2016). According to this theory, learning is viewed as a process of habit formation, which is also affected by learners’ innate characteristics (Yu and Odlin, 2015). Learners’ behaviour is predominantly explained by the stimulus-response principle, according to which foreign students respond to the stimulus that they get from their environment (Graham and Post, 2018). However, the role of inner characteristics in the second language acquisition process should not be underestimated. As noted by Carrasco-Ortiz et al. (2017) learners’ linguistic habits and skills influence their ability to acquire a second language. The researchers arrived at the conclusion that students whose native language had similarities with their second language acquired this language more easily compared to those individuals whose mother tongue had little in common with the host country’s language (Carrasco-Ortiz et al., 2017). 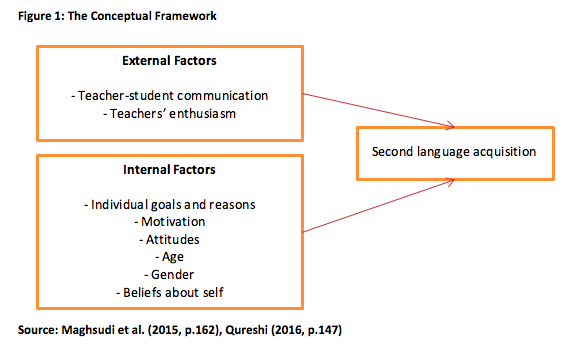 The sociocultural and behaviourist theories imply that foreign students’ ability to acquire their second language depends on both internal and external factors. External factors ‘stem’ from the external environment, in which language learning exists (Mahmoudi and Mahmoudi, 2015). These factors can include foreign students’ social class, teachers, first language and L2 curriculum (Khan et al., 2017). For example, Mastoory et al. (2016) reported the quality of the teacher-student communication played a crucial role in TESOL. Nevertheless, teachers’ personal attitudes and perceptions should also be considered when assessing foreign students’ L2 learning. Teachers’ formative experiences, ideology, personality, enthusiasm, openness and skills are also among the external factors that influence learners’ L2 learning (Selvi and Martin-Beltran, 2016; Mahmoudi and Mahmoudi, 2015). For example, more traditional teachers tend to act as instructors and the main source of knowledge. By contrast, more progressive teachers act as the facilitators of learning experiences and encourage students to become the active agents of their learning (Al-Daihani et al., 2016). Hence, environmental support is an important external factor that affects foreign students’ L2 learning. Although the external environment affects foreign students’ second language learning, the impact of internal factors on this process is widely acknowledged as more significant (Awwad et al., 2017). These factors imply various affective and cognitive variables, including student motivation, attitudes, beliefs and perceptions (Hernandez and Rankin, 2014). According to the existing body of literature, motivation correlates strongly with foreign students’ L2 proficiency. For instance, Crain et al. (2016) found that successful language learners were highly motivated. Moeller and Catalano (2015) also indicated that motivation helped students generate learning and overcome the difficulties they encountered in the L2 learning process. At the same time, motivation can either be extrinsic or intrinsic in nature (Morazes, 2016; Holliday, 2015). This fact implies that foreign students’ motivation to learn their second language, which is attributed to behavioural factors, can be ‘created’ by their own attitudes and perceptions as well as the external social environment in which they exist. Students’ own goals and reasons for learning were reported by Ma et al. (2017) to be among the internal motivational factors that influenced their L2 learning success. The researchers found that self-motivated students were more successful in second language acquisition in comparison with those learners who were not motivated by their personal goals and reasons (Ma et al., 2017). However, Blaj-Ward (2017) emphasised the role of the external environment in students’ L2 learning process. According to the extrinsic motivation concept, this environment should be favourable and supportive of students in order to contribute to their success (Graham and Post, 2018; Hammer, 2017). Nevertheless, van Rinsveld et al. (2016) noted that extrinsically motivated students had little or no interest in tasks as they placed the responsibility on their teachers. Similar to motivation, students’ attitudes are considered as the most important factors that affect their L2 proficiency (Moeller and Catalano, 2015). In accordance with Fry et al. (2014), learners may have both positive and negative attitudes towards the L2 being learnt. On the one hand, foreign students can have positive attitudes towards the L2 speakers and the culture represented by these individuals (Mahmoudi and Mahmoudi, 2015). As noted by Mazak and Carroll (2016), these positive attitudes contribute to foreign students’ L2 learning since they are willing to communicate with native speakers. Therefore, if foreign students are interested in the host country and its culture, they may be more encouraged to learn its language. On the other hand, negative attitudes are considered to impede L2 learning. According to Moeller and Catalano (2015), difficulties with the teacher or native speakers and the lack of interest usually results in foreign students’ negative attitudes. Nevertheless, negative attitudes are not always associated with negative effects. As noted by Al-Daihani et al. (2016), students who experience difficulties in learning a foreign language can still achieve success in this process. The role of age and gender in L2 learning has also been widely acknowledged by previous researchers. Dirix and Duyck (2017) argued that the younger the students were, the more successful and effective TESOL programmes were. One potential explanation is that the level of children’s brain plasticity is higher in comparison with adults (Hiba, 2015; Archila-Suerte et al., 2015). At the same time, Al-Daihani et al. (2016) noted that adults were better L2 learners since they were able to start off faster compared to children. Maghsudi et al. (2015) attempted to assess the impact of gender on foreign language learning. The researchers arrived at the conclusion that male and female learners used different learning strategies, since society laid down different social roles for them (Maghsudi et al., 2015). This statement is in line with the sociocultural theory, which implies that students’ L2 proficiency is affected by their external environment, in which they exist (Hiba, 2015). Nevertheless, Maghsudi et al. (2015) still failed to identify whether the adoption of different learning strategies had any impact on the L2 learning success of male and female students. Beliefs about self also belong to the factors that affect students’ ability to learn a second language. According to Dewaele et al. (2017), students who demonstrate higher levels of self-efficacy are more successful in their L2 learning. At the same time, anxiety produces a negative effect on students’ ability to learn their second language as it does not allow them to become fully satisfied with their accomplishments (Dewaele et al., 2017). In the same vein, Dornyei and Ryan (2015) noted that anxious learners shared many similarities with perfectionists, which contributed to a higher level of their concern over the errors they made in comparison with non-anxious students. Some researchers report that there is a direct relationship between the level of anxiety and students’ L2 learning success. For example, according to Dewaele (2015), students experiencing negative emotions such as anxiety and anger are more willing to destroy obstacles in their path, which can result in academic success. The conceptual framework of this study is presented as follows. It is relevant to summarise that socio-psychological factors that influence foreign students’ L2 proficiency can be divided into two groups, namely external and internal factors (Selvi and Martin-Beltran, 2016). The quality of teacher-student communication and English teachers’ enthusiasm are usually attributed to the external factors that affect foreign students’ L2 learning (Mahmoudi and Mahmoudi, 2015). In turn, individual goals and reasons, attitudes, age, gender, beliefs about self and motivation refer to the internal factors group (Moeller and Catalano, 2015). The positivist philosophy, which implies working with an observable social reality, has been selected for this project (Flick, 2015). The selection of this epistemological stance is justified by the need to design a structured methodology and facilitate replication. In accordance with this philosophy, only observable phenomena can lead to the production of credible data and research outcomes (Patton, 2014). Therefore, by adopting the positivist stance, it is possible to develop a rigorous methodology (Chawla and Sodhi, 2011). By contrast, Pruzan (2016) noted that positivist projects experienced a lack of flexibility, which limited researchers’ ability to change the research design in the course of a study. The positivist philosophy is highly compatible with the deductive research approach that involves the development of a theory, which is subjected to a practical test (Devi, 2017). The selection of this approach is justified by a large body of scholarly and empirical literature on the factors that influence foreign students’ second language learning (Dornyei and Ryan, 2015; Jones and Mixon, 2016). Using this literature, it is possible to formulate a set of hypotheses and test them in a practical context. At the same time, Sahu and Singh (2016) noted that deductive projects lagged behind their inductive ‘counterparts’ in terms of novelty. The point is that the adoption of the deductive approach does not allow for producing novel and unique empirical findings as they do not involve the development of new theory (Saunders et al., 2015). The survey strategy, which belongs to the deductive approach, has been selected for the purpose of this project. Surveys are popular with education researchers and practitioners since they allow for gathering primary data in a highly economical manner (Mackey and Gass, 2015). The survey strategy is usually associated with two major data collection techniques, namely questionnaires and interviews. This dissertation is in keeping with self-administered questionnaires due to their ability to generate a large amount of data in a short period of time (Pruzan, 2016). Furthermore, self-administered questionnaires are focused on the collection of quantitative data, which can be easily processed graphically and statistically (Patton, 2014). Finally, this choice is justified by the fact that self-administered questionnaires are usually used when it is necessary to establish a cause-and-effect relationship between variables (Chawla and Sodhi, 2011). Given that this study attempts to examine what socio-psychological factors influence foreign students’ second language learning, the selection of this data collection technique is justified. Although the use of self-administered questionnaires is associated with a range of advantages, the data collected by means of this technique is not as wide-ranging as the data gathered by other strategies (Patton, 2014). Alternative to open-ended interviews, self-administered questionnaires do not allow respondents to give detailed answers. Instead, participants are offered to select from several determined answers, which may not necessarily be in keeping with their attitudes and perceptions (Howell, 2012). Another limitation of this data collection technique refers to the lack of validity and reliability compared to interviews. The point is that the researcher is not actually involved in the data collection process during a questionnaire survey. As a result, there is no guarantee that questionnaires are completed by the actual members of the target population or are competed at all (Flick, 2015). This fact emphasises another limitation of questionnaire surveys, which is a low response rate (Kumar, 2014). A copy of the questionnaire used in this study can be found in Appendix A. The sample of this project was drawn from 114 foreign students of British universities and business schools with the help of the non-probability convenience sampling technique. Around 300 questionnaires were distributed among potential respondents via social networking services. Out of 138 questionnaires sent back to the researcher, only 114 were included in the final sample because of missing data. Both graphical and statistical methods of analysis were employed to process the collected data. The analysis of variance (ANOVA), descriptive statistics, linear regression and graphical representation were among the analysis instruments used in this dissertation. All calculations were performed in Excel and SPSS. The following table presents and defines all the variables used in the analysis. The regression model designed for the purpose of this study is presented as follows. The testable hypotheses formulated for the purpose of this project are presented as follows. H0: Socio-psychological factors do not produce any significant impact on foreign students’ second language learning. H1: External socio-psychological factors produce a strong effect on foreign students’ L2 proficiency. H2: Internal socio-psychological factors considerably influence foreign students’ second language acquisition. H3: Age and gender have an impact on foreign students’ second language learning. According to Patton (2014), it is beneficial to construct detailed respondent profiles in order to ensure that the sample is drawn from the target population members. As noted in the methodology chapter, primary data was collected from 114 foreign students. Almost half or 47% of the participants reported they were between 18 and 20 years. In turn, around one third or 27% of those surveyed indicated they belonged to the 21-23 age group. 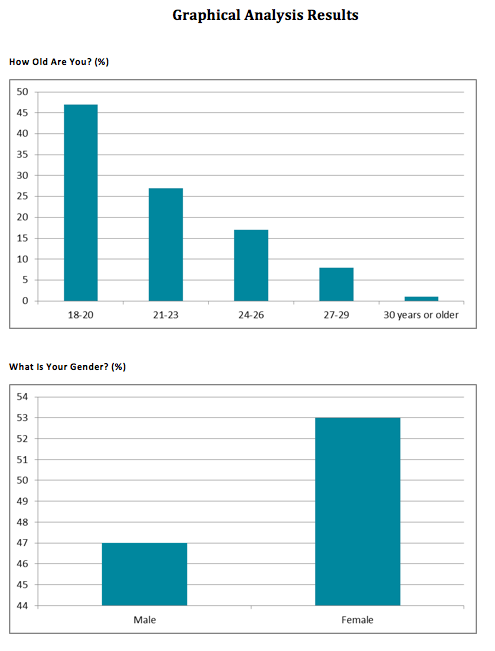 The respondents who were between 24 and 26 years formed 17% of the sample. Finally, a total of only 9% of the foreign students reported they were either between 27 and 29 years or 30 years and older. These findings demonstrate that the sample is drawn from the foreign students who belong to different age groups. This distribution is beneficial to the analysis since it allows for identifying whether the age variable has any effect on the respondents’ L2 learning. The table above also shows that male and female learners accounted for 47% and 53% of the sample, respectively. This relatively even distribution also allows for identifying whether there is any difference between male and female foreign students in term of their second language learning. In accordance with the literature review chapter, foreign learners’ L2 acquisition is affected by numerous social-psychological factors (Ma et al., 2017; Dornyei and Ryan, 2015). The descriptive statistics function was performed in SPSS to identify the factors that are perceived by the respondents as the most and least important. The Mean of two variables, namely MOT and GOA is the highest in the variable set and equal to 4.07 and 4.03, respectively. The Standard Deviation of these variables is close to 1, indicating the responses collected from the foreign students are not far from the Mean. Thus, motivation and individual goals are considered by the majority of the respondents to be the most important socio-psychological factors. These outcomes give support to Morazes’ (2016) findings, according to which the role of students’ intrinsic and extrinsic motivation in their L2 proficiency is considerable. By contrast, the Mean of the NEG variable is the lowest and equal to 2.53. Given that the Standard Deviation of this variable slightly exceeds 1, it can be stated that the majority of the collected responses are close to the Mean. Hence, most respondents either disagreed or strongly disagreed they were usually anxious and angry when learning the English language. These findings are further strengthened by the graphical analysis outcomes, which are presented as follows. 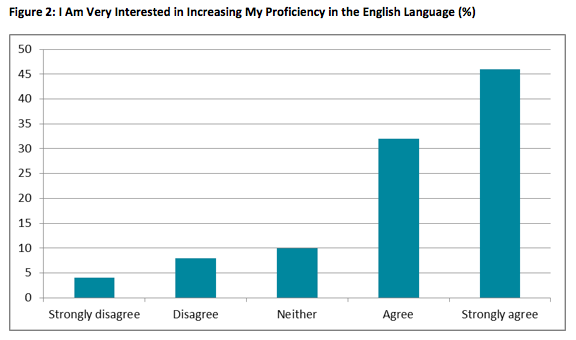 In total, the overwhelming majority or 76% of those surveyed either agreed or strongly agreed they were very interested in increasing their proficiency in the English language. On the contrary, the foreign students who either disagreed or strongly disagreed with their counterparts totalled 12% of the sample. The remaining 10% of the individuals selected the ‘Neither’ response option. The produced graphical results further support the idea of Moeller and Catalano (2015) who argued that motivation helped students succeed in their L2 learning process. 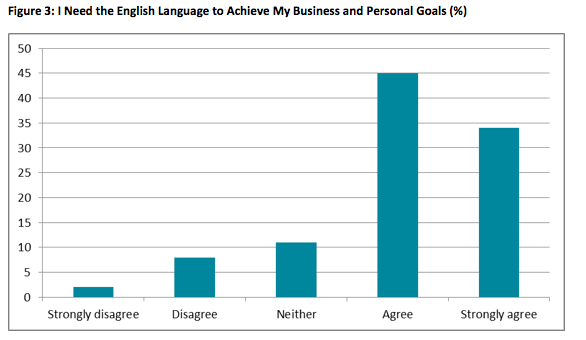 The participants who either agreed or strongly agreed they needed the English language to achieve their business and personal goals accounted for 45% and 34% of the sample, respectively. At the same time, only a minority or a total of 10% of those who returned their questionnaire either disagreed or strongly disagreed English was a required tool to attain their individual goals. Finally, 11% of the foreign students provided the researcher with neutral responses. These findings are in agreement with Ma et al. (2017) who showed that self-motivated students were more successful in second language acquisition in comparison with those learners who were not motivated by their personal objectives. The remaining graphical analysis outcomes can be found in Appendix B. The effect of socio-psychological factors on the respondents’ second language learning was examined with the help of the linear regression function performed in SPSS. The statistical analysis outcomes are presented by means of the following table. Only two independent variables, namely COM and POS establish a statistically significant relationship with the dependent variable. This statement is made since the Sig. of the COM variable is much lower than the threshold value of 0.05. Thus, the link between this predictor and the dependent variable is statistically significant at least at 95% (Bryman and Cramar, 2011). B coefficient is positive, meaning the relationship between the variables is also positive. Therefore, the more foreign students are interested in increasing their proficiency in the English language, the better results they achieve in their L2 learning. The produced statistical outcomes are in keeping with Crain et al. (2016) who also arrived at the conclusion that motivation correlated strongly with foreign students’ L2 proficiency. 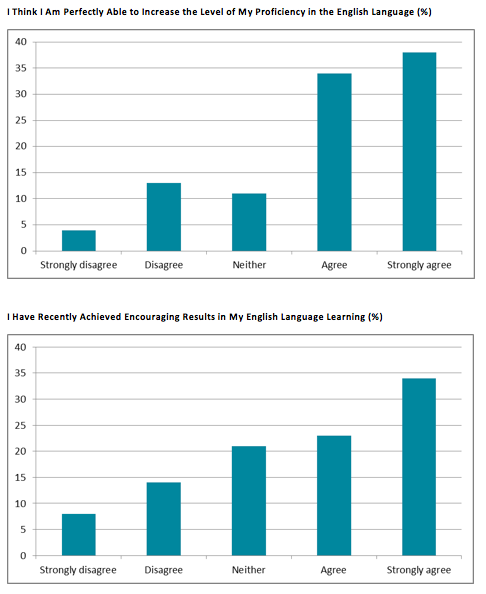 Thus, successful language learners are more motivated in comparison with those whose L2 proficiency is not considerable. The Sig. of the POS variable is also significantly lower than 0.05, which is the threshold value. These findings demonstrate that POS has statistically significant power over LER, which is the dependent variable. The table above also shows that B coefficient of the POS predictor is positive, meaning the established statistical link is also positive. Therefore, this relationship can be interpreted as follows: the more foreign students are open-minded and enthusiastic when learning the English language, the more they are capable of achieving good results in their L2 learning process. Similar to this dissertation, Mazak and Carroll (2016) found that positive attitudes added to the success of foreign students’ L2 learning since they were more willing to communicate with native speakers and acquire knowledge. At the same time, Dewaele et al. (2017) noted that negative attitudes such as anxiety and anger produced a damaging impact on students’ ability to learn their second language as these attitudes did not allow them to become fully satisfied with their accomplishments. Nevertheless, this project failed to establish any statistically significant relationship between the respondents’ negative attitudes and their second language learning since the Sig. of the NEG variable is higher than the threshold value of 0.05. The table above also demonstrates that none of the remaining predictors have any statistically significant power over the dependent variable. It is important to identify the extent to which the constructed regression model is reliable in order to ensure the credibility of the produced statistical analysis findings (Bryman and Cramar, 2011). The Variance Inflation Factor (VIF) is one of the tools that allow for measuring the reliability of regression models. The VIF helps to identify whether the correlations among the independent variables are strong. The table above demonstrates that the VIF of all independent variables is lower than the threshold value of 5. Thus, none of the variables are collinear and the empirical findings do not show multi-collinearity (Bryman and Cramar, 2011). These findings suggest that the regression analysis results are not paradoxical and none of the variables should be excluded from the constructed regression model. The outcomes of the remaining reliability analyses are presented as follows. The value of the R-square measure, which shows the amount of variation in the result that is explained by the predictors in the designed regression model, is equal to 0.273. Thus, the model explains around 27% of the variability of the response data around its Mean. In turn, the value of the F-test measure, which allows for assuming whether all independent variables in the regression model are zero, is 4.917. Therefore, the likelihood of all independent variables being zero is very small. These findings allow for stating that the designed regression model is highly reliable. As noted in the literature review chapter, foreign students’ age and gender are considered to play an important role in their foreign language learning (Archila-Suerte et al., 2015; Hiba, 2015). The one-way ANOVA function was performed in SPSS to identify whether there is a statistically significant difference between male and female foreign students in their L2 learning. The Sig. of the LER variable is much higher than the threshold value of 0.05. Therefore, there is no statistically significant difference in foreign language learning between the male and female survey participants. These findings are contrary to those of Maghsudi et al. (2015) who arrived at the conclusion that girls achieved significantly better results in L2 learning in comparison with boys. The following table shows whether there is a statistically significant difference in second language learning between the respondents who belong to different age groups. The value of the Sig. is equal to 0.241, which is higher than the threshold value of 0.05. Hence, according to the ANOVA results, there is no statistically significant difference in second language learning between the survey participants of different ages. These findings do not support the previous research, which implies that younger students are more successful and effective in TESOL programmes in comparison with their older counterparts (Dirix and Duyck, 2017). The purpose of this dissertation was to examine what socio-psychological factors influence foreign students’ second language learning in the context of the British higher education system. This aim has been fulfilled by collecting primary quantitative data from 114 foreign students by means of self-administered questionnaires. The methods of analysis employed in this study included graphical representation, ANOVA, descriptive statistics and linear regression. The first research objective was to review the most relevant second language theories relying on the existing literature. It is relevant to conclude that, according to behaviourism and the sociocultural theory, foreign students’ second language acquisition is mediated by the social environment in which they exist as well as their inner characteristics such as perceptions, values and attitudes (Ruiz-Funes, 2015; Ma et al., 2015). The second objective was to identify the external and internal factors that influence foreign students’ second language acquisition. This objective was partly attained in the literature review chapter. Using the findings from Chapter 2, it is relevant to conclude that there are numerous external and internal factors that affect foreign students’ ability to acquire their second language (Cole et al., 2017). For example, the social environment, in which foreign students exist, and teachers’ support and competence are usually attributed to the internal factors group (Al-Madani, 2015). In turn, students’ motivation, personal goals, attitudes and perceptions are widely reported to be among the external factors that predict the success of their L2 learning (Qureshi, 2016; Arnon et al., 2017). However, the empirical analysis outcomes have indicated that not all these factors predict foreign students’ L2 learning. The next objective was to identify the most important socio-psychological factors that have an impact on foreign students’ L2 learning in the UK. This objective was fully attained in the analysis and findings chapter. It can be concluded that foreign students’ motivation and personal goals are the only internal factors that affect their foreign language learning. The analysis outcomes have demonstrated that the more foreign students are interested in increasing their proficiency in English and are open-minded and enthusiastic when learning this language, the better results they achieve in L2 learning. In the same vein, Hernandez and Rankin (2014) found that motivation correlated strongly with foreign students’ second language proficiency. At the same time, this project failed to establish any statistically significant link between the external factors and foreign students’ L2 learning. Alternative to this project, Mahmoudi and Mahmoudi (2015) reported that teachers’ personality and enthusiasm affected learners’ second language acquisition. The role of age and gender in students’ second language proficiency was also identified as insignificant. Considering the analysis findings, it can be concluded that the Null Hypothesis, according to which socio-psychological factors do not produce any significant impact on foreign students’ second language learning, has been rejected. Hypothesis 1, which implies that external socio-psychological factors produce a strong effect on foreign students’ L2 proficiency, has also been rejected. By contrast, Hypothesis 2, which states that internal socio-psychological factors considerably influence foreign students’ second language acquisition, has been confirmed. Finally, Hypothesis 3, according to which age and gender have an impact on foreign students’ second language learning, has been rejected. One of the main limitations of this dissertation refers to the fact that foreign students’ second language learning was examined relying on their perceptions and attitudes. This fact may involve a certain amount of bias and subjectivity in the research outcome (Patton, 2014). By assessing the impact of various socio-psychological factors on foreign students’ L2 learning from the perspective of teachers would have allowed for arriving at more comprehensive conclusions. Another limitation of this project refers the use of the non-probability convenience sampling technique. As noted by Howell (2012), this sampling method does not allow for ensuring that the drawn sample is representative of the whole population. Hence, the generalisability of this study is also limited. The fourth research objective was to provide British teachers with relevant recommendations as how to contribute to the effectiveness of their foreign students’ L2 learning process. Based on the analysis findings, it is recommended that British teachers should provide their foreign students with relevant rewards such as prizes and good grades for their effort and celebrate their achievements (Dornyei and Ryan, 2015). Another recommendation is that British teachers should make class fun to facilitate the development of foreign students’ positive attitudes. This can be done through the use of social media and multi-media (e.g. films and music) as well as games in the classroom (Blaj-Ward, 2017). Al-Daihani, H., Al-Yaman, A. and Almutairi, A. (2016) “Review of factors affecting second language learning”, International Journal of Education, Learning and Development, 4 (2), pp. 26-34. Al-Madani, F. (2015) “Relationship between Teachers’ Effective Communication and Students’ Academic Achievement at the Northern Border University”, European Journal of Educational Research, 4 (2), pp. 90-96. Archila-Suerte, P., Zevin, J. and Hernandez, A. (2015) “The effect of age of acquisition, socioeducational status, and proficiency on the neural processing of second language speech sounds”, Brain and Language, 141 (1), pp. 35-49. Arnon, I., McCauley, S. and Christiansen, M. (2017) “Digging up the building blocks of language: Age-of-acquisition effects for multiword phrases”, Journal of Memory and Language, 92 (1), pp. 265-280. Awwad, A., Tavakoli, P. and Wright, C. (2017) “‘I think that’s what he’s doing’: Effects of intentional reasoning on second language (L2) speech performance”, System, 67 (1), pp. 158-169. Blaj-Ward, L. (2017) Language Learning and Use in English-Medium Higher Education, New York: Springer. Carrasco-Ortiz, H., Herrera, A., Jackson-Maldonado, D., Ramirez, G., Pereyra, J. and Wicha, N. (2017) “The role of language similarity in processing second language morphosyntax: Evidence from ERPs”, International Journal of Psychophysiology, 117 (1), pp. 91-110. Cole, M., Dunston, P. and Butler, T. (2017) “Engaging English language learners through interactive read-alouds: A literature review”, English Teaching: Practice & Critique, 16 (1), pp. 97-109. Crain, S., Koring, L. and Thornton, R. (2016) “Language acquisition from a biolinguistic perspective”, Neuroscience & Biobehavioral Reviews, 81 (Part B), pp. 120-149. Devi, P. (2017) Research Methodology: A Handbook for Beginners, Chennai: Notion Press. Dewaele, J. (2015) “On emotions in foreign language learning and use”, The Language Teacher, 39 (1), pp. 13-15. Dewaele, J., Witney, J., Saito, K. and Dewaele, L. (2017) “Foreign language enjoyment and anxiety: The effect of teacher and learner variables”, Language Teaching Research, 1 (1), pp. 1-22. Dirix, N. and Duyck, W. (2017) “The first-and second-language age of acquisition effect in first-and second-language book reading”, Journal of Memory and Language, 97 (1), pp. 103-120. Dornyei, Z. and Ryan, S. (2015) The psychology of the second language learner revisited, New York: Routledge. Egalite, A., Kisida, B. and Winters, M. (2015) “Representation in the classroom: The effect of own-race teachers on student achievement”, Economics of Education Review, 45 (1), pp. 44-52. Flick, U. (2015) Introducing Research Methodology: A Beginner’s Guide to Doing a Research Project, London: SAGE. Fry, H., Ketteridge, S. and Marshall, S. (2014) A Handbook for Teaching and Learning in Higher Education: Enhancing Academic Practice, London: Routledge. Gardner, R. (2010) Motivation and Second Language Acquisition: The Socio-Educational Model, New York: Peter Lang Publishing. Graham, C. and Post, B. (2018) “Second language acquisition of intonation: Peak alignment in American English”, Journal of Phonetics, 66 (1), pp. 1-14. Hammer, K. (2017) “Language through a prism: Patterns of L2 internalisation and use in acculturated bilinguals”, Journal of Pragmatics, 117 (1), pp. 72-87. Hernandez, R. and Rankin, P. (2014) Higher Education and Second Language Learning: Promoting Self-Directed Learning in New Technological and Educational Contexts, New York: Peter Lang Publishing. Hiba, G. (2015) “The influence of gender and age in SLA”, Working Paper, pp. 1-8. Holliday, J. (2015) “A longitudinal study of the second language acquisition of a three-way stop contrast”, Journal of Phonetics, 50 (1), pp. 1-14. Jones, K. and Mixon, J. (2016) Intercultural Responsiveness in the Second Language Learning Classroom, Hershey: IGI Global. Khan, A., Khan, S., Zia-Ul-Islam, S. and Khan, M. (2017) “Communication Skills of a Teacher and Its Role in the Development of the Students’ Academic Success”, Journal of Education and Practice, 8 (1), pp. 18-21. Ma, F., Chen, P., Guo, T. and Kroll, J. (2017) “When late second language learners access the meaning of L2 words: Using ERPs to investigate the role of the L1 translation equivalent”, Journal of Neurolinguistics, 41 (1), pp. 50-69. Ma, T., Chen, B., Lu, C. and Dunlap, S. (2015) “Proficiency and sentence constraint effects on second language word learning”, Acta Psychologica, 159 (1), pp. 116-122. Mackey, A. and Gass, S. (2015) Second Language Research: Methodology and Design, London: Routledge. Maghsudi, M., Sharifi, E. and Abedi, S. (2015) “The Effect of Gender on Foreign Language Learning”, International Journal of Educational Investigations, 2 (2), pp. 162-166. Mahmoudi, S. and Mahmoudi, A. (2015) “Internal and External Factors Affecting Learning English as a Foreign Language”, International Journal of Language and Linguistics, 3 (5), pp. 313-322. Mastoory, Y., Harandi, S. and Abdolvand, N. (2016) “The effects of communication networks on students’ academic performance: The synthetic approach of social network analysis and data mining for education”, International Journal on Integrating Technology in Education, 5 (4), pp. 23-34. Mazak, C. and Carroll, K. (2016) Translanguaging in Higher Education: Beyond Monolingual Ideologies, London: Multilingual Matters. Moeller, A. and Catalano, T. (2015) “Foreign Language Teaching and Learning”, in Wright, J. (ed.) International Encyclopedia for Social and Behavioral Sciences, 2nd ed., Oxford: Pergamon Press, pp. 327-332. Morazes, J. (2016) “Educational background, high school stress, and academic success”, Children and Youth Services Review, 69 (1), pp. 201-209. Pawlak, M. (2011) Extending the Boundaries of Research on Second Language Learning and Teaching, New York: Springer. Pruzan, P. (2016) Research Methodology: The Aims, Practices and Ethics of Science, New York: Springer. Qureshi, M. (2016) “A meta-analysis: Age and second language grammar acquisition”, System, 60 (1), pp. 147-160. Ruiz-Funes, M. (2015) “Exploring the potential of second/foreign language writing for language learning: The effects of task factors and learner variables”, Journal of Second Language Writing, 28 (1), pp. 1-19. Sahu, S. and Singh, T. (2016) Research Methodology: Latest Edition, New Delhi: SBPD Publications. Selvi, A. and Martin-Beltran, M. (2016) “Teacher-learners’ engagement in the reconceptualization of second language acquisition knowledge through inquiry”, System, 63 (1), pp. 28-39. VanRinsveld, A., Schiltz, C., Brunner, M., Landerl, K. and Ugen, S. (2016) “Solving arithmetic problems in first and second language: Does the language context matter?”, Learning and Instruction, 42 (1), pp. 72-82. Yu, L. and Odlin, T. (2015) New Perspectives on Transfer in Second Language Learning, London: Multilingual Matters. Zhou, M. (2016) “The roles of social anxiety, autonomy, and learning orientation in second language learning: A structural equation modeling analysis”, System, 63 (1), pp. 89-100.